Hue suggested the capital city enhance investment and development cooperation, and consider foreign investors as important partners. By December 31, 2018, Hanoi had nearly 4,500 valid investment projects with total registered capital of 36.6 billion USD, said Vice Chairman of the municipal People’s Committee Nguyen Doan Toan. In 2018, Hanoi led the nation in FDI attraction with 7.5 billion USD, up 2.18 times against the previous year, the highest level over the past 30 years since its implementation of the policy to attract foreign investment, Toan noted. The most attractive fields include real estate (29.53 percent), the processing and manufacturing industry (20.1 percent), and information communication (11.48 percent). Japan is currently the biggest investor with nearly 10.2 billion USD, followed by Singapore with 6 billion USD, and the Republic of Korea with 5.48 billion USD. 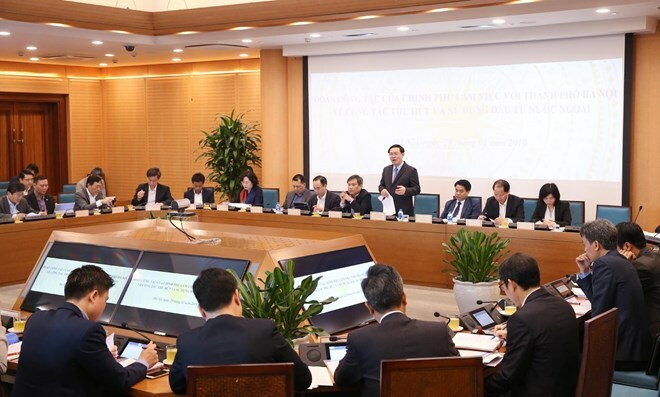 To reap these outcomes, Hanoi has met directly with investors to discuss their short- and long-term investment plans in the city, said Chairman of the municipal People’s Committee Nguyen Duc Chung. The city has also worked to improve the environment, including efforts to collect and treat waste, or deal with air pollution, and reform administrative investment procedures, he added. In 2019-2020, Hanoi has defined some priority industries to draw investment in, towards joining global value chains and optimising the city’s advantages and strengths. It also identified key markets to expand in, such as the US, the European Union (EU), Japan, and the Republic of Korea. The city will focus on attracting high-tech, high added value, and environmentally friendly projects, while studying the establishment of a financial and high-tech centre at national and regional levels./.